“Reasonable articulable suspicion” (RAS) and “probable cause” (PC) are two of the most important concepts in criminal work. However, reading those two phrases does not provide much information about what they mean, how they work, or when they apply. However, having a clear understanding of both concepts and when they apply is essential in defending criminal charges. Below is a discussion of RAS and PC, but it is far from every detail you would need to consider when applying these concepts in a case. RAS and PC have been interpreted many times across many jurisdictions and judges, and they are often phrased in similar, but different, ways. RAS is commonly understood as objective, specific information known by a police officer or other governmental law enforcement agent that leads them to suspect a person has, or is about to, commit a crime. RAS is the easiest burden to establish in the law. It takes less information to demonstrate an officer had RAS than to show PC, proof by the preponderance of the evidence, or proof beyond a reasonable doubt. PC is a close relative of RAS. However, PC is viewed as a slightly higher hurdle to clear, though it is still below proof beyond a reasonable doubt or proof by the preponderance of the evidence. PC is commonly understood as facts and circumstances known to a police officer that would lead a “prudent man” to believe that a particular suspect has committed or was committing an offense or has evidence of an offense. When officers’ actions are challenged because they either lack PC or RAS, courts must look to the totality of the circumstances known to the officer to determine whether that officer’s actions were proper. The definitions of reasonable articulable suspicion and probable cause are very similar and difficult to distinguish. However, the circumstances in which RAS and PC apply help courts impose the proper burden on the investigating officer when RAS or PC for an officer’s actions are challenged. Thus, it is extremely important to know which concept applies to which situations. Reasonable articulable suspicion is what an officer needs to perform an “investigatory” stop. An investigatory stop can include pulling over a car, stopping a person on foot to engage in a conversation, and conducting a pat down or frisk for weapons. 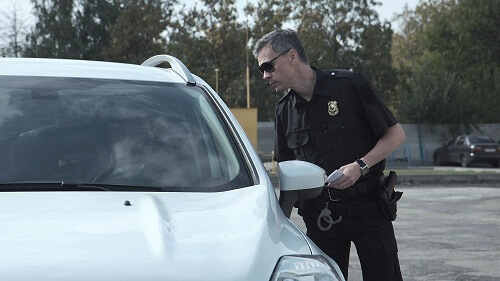 The most common example of reasonable articulable suspicion is when an officer pulls over a car for a traffic offense. For example, if a suspect is pulled over for having a taillight out, that would be RAS for purposes of conducting the stop. Once the stop is justified, if the officer smells marijuana in the car, or if the individual had signs of intoxication, then the officer can extend the stop to further investigate. Another common scenario is the stop and frisk. A police officer may see a suspect standing on a street corner having numerous brief interactions with apparent passersby. While watching the suspect, the officer may observe him shifting an object underneath his clothes near his beltline. In this scenario, the officer may have sufficient RAS to stop the suspect from walking away and even to frisk him. Whether the officer is entitled to remove things from the suspect’s person is a different question. Probable cause on the other hand, applies to arresting an individual for a crime, searching them or their vehicle, and requesting a warrant to search their home or other tangible property (like a cell phone). One of the most common examples of PC for a search is the vehicle stop scenario. If, for example, an officer pulls a suspect over for speeding or some other minor traffic offense but smells marijuana emanating from the vehicle, they may have PC to search the vehicle. Thus, whether the suspect agrees to a search or not, their car may be thoroughly searched to find the suspected evidence. The foregoing examples are just a few common scenarios in which PC and RAS play a role. There are numerous other scenarios in which these legal concepts play a role. It is important to know the concepts of PC and RAS and how they are applied by courts because a suspect can suppress certain aspects of the government’s case when an officer does not have the required level of information. Assume that a suspect is pulled over for a taillight that has gone out. If during the stop the officer does not smell marijuana, but suspects there is marijuana in the car because he has pulled this particular suspect over before and found marijuana on him, the subsequent search of the car could be found illegal. Searching a car on the basis of prior conduct alone is usually not enough to support a PC finding, though in some cases that may be possible. No matter what type of offense you have been charged with, you need to know whether the officer had sufficient PC or RAS to stop you, frisk you, search you or your property, or take other action that leads to finding evidence against you or arresting you. Our experienced criminal defense attorneys routinely evaluate and argue issues related to PC and RAS in a wide variety of cases. Call Greenspun Shapiro today to discuss whether you can challenge the arrest, search, or other conduct of the police, and to find out how raising such a challenge may help your case.